Mix all ingredients together, make into .5 or 1" meatballs, or really any size you like. 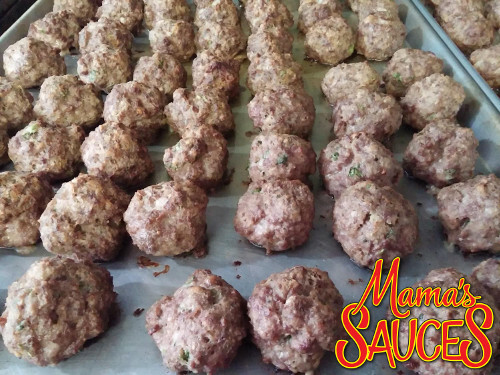 Bake meatballs for approximately 20 minutes at 375 degrees, place meatballs into Mama's Fra Santi, Marinara or Spicy Marinara Sauce and let simmer until you are ready to eat! They are DELICIOUS! If you came to St Pete Pride and loved the meatballs, this is the recipe! Add Mama's Fra Santi Sauce for a delicious dinner, put it over any pasta, or eat with fresh bread. ENJOY!